Having an ecommerce website that truly reflects your brand is one of the most crucial aspects of any successful retail business. As a company specializing in ecommerce, we’re often asked, “How much do you charge to build an ecommerce website?” or “What is the basic cost of ecommerce website?” Over the past 10 years, we’ve cooperated with lots of ecommerce brands. We’ve designed around hundreds of websites. Unfortunately, there is no exact answer to this question. The cost of starting an ecommerce website is very subjective and the honest answer is quite obvious: it depends. The ecommerce website quote estimation is typically a tricky thing. It varies depending on numerous factors, such as business goals, project scope, the method of development, hosting, design complexity, setup, integrations, maintenance, features, and functionalities. In this article we’re going to analyze all the costs involved in launching and maintaining websites of various sizes to give you a clear idea about the cost of ecommerce website development. 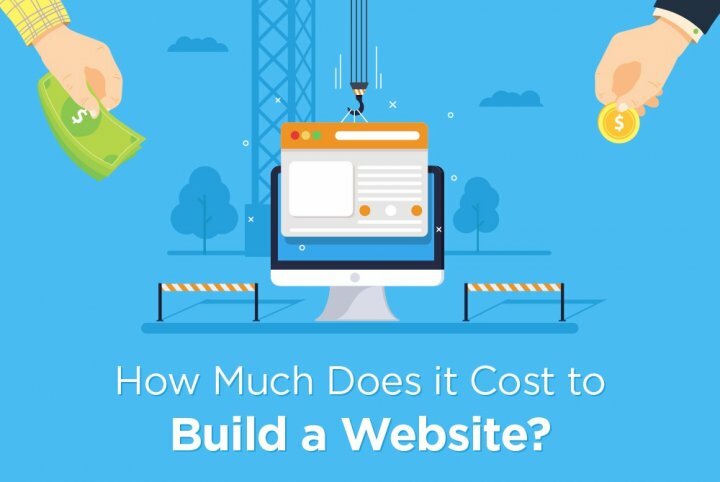 Website cost. Image credit: engineerbabu. Let’s check out some important aspects you need to take into consideration to determine the online store development cost. What is the size of your business? Ecommerce stores are usually differentiated by the number of products they sell and the amount of traffic their websites receive. Small business. If you have a limited range of products, a small customer base, and no intention to expand in the near future, it’s better to keep things simple and try to save some money. There are many possibilities on the market to design your online store investing not so much. Mid-size business. If you have a decent range of highly specialized products, an average customer base and you consider increasing your sales in the future, it’s better to search for solutions that can help you to reach your goals. You will need to have robust features and functionalities and might require implementing a few plug-ins or extensions. When setting up your budget you have to take into account the cost needed for custom software development. Enterprise business. If you have a wide range of products, a large customer base and you’re well-established in the market you need to choose a perfect solution for your enterprise business. This solution should provide scalability, manage large inventories, unlimited categories, multiple sales channels, and product attributes. Don’t forget about Enterprise Resource Planning (ERP) and Customer Relationship Management (CRM) systems integration. Enterprise store development requires a considerable budget. These days, building an online store has become so much easier than a few years ago, thanks to variety of ecommerce platforms becoming available on the market. Certainly, you’ve heard about such ecommerce solutions as Magento, Shopify, WooCommerce, Hybris, and Salesforce. These platforms offer an easy way to design website infrastructure, and include ready-made layouts, content management system, search and filtering, payment, and shipping integrations. If you’re interested in finding out more about these ecommerce solutions, we’ve written a useful guide on how to select the most reliable enterprise ecommerce platform tailored towards your specific business requirements. Whatever ecommerce platform you choose, most often you still need to hire a team with certain technical skills to be able to launch and maintain your online store (unless you’re using SaaS platforms like Shopify, Wix, or Squarespace). A developer can charge $10-250 per hour to develop an online store. The rate largely depends on the region where you hire a developer, but can also depend on experience and qualifications. Website design. Image credit: engineerbabu. The design is a crucial factor that contributes to the overall cost. 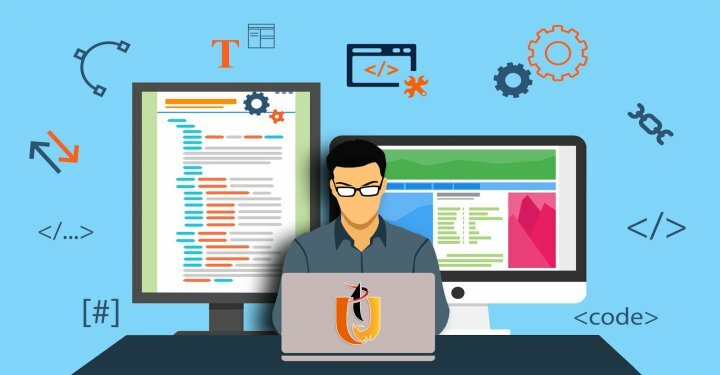 If you need a unique design for your online store, then it’s better to hire a professional team with a strong UI/UX expertise. What is the average cost to develop an online store design? Usually, the cost can range from $250 to $20,000 depending on the design’s complexity and requirements. Lot’s of platforms, especially SaaS-based, have design galleries offering various readymade themes you can implement into your online store yourself. These themes don’t take into account the characteristics of a particular business. Also, other online retail companies might apply the same templates. However, template-based design is fast and inexpensive. Anticipate spending from $0 to $300 to purchase a template and $1,000 to $3,000 if you want to alter or customize the template. Remember that you still need taking into additional budget to spend on logos, banners or creative images. Another option is to apply a custom-made design. It gives you the opportunity to design a website that is unique to your business. You can design any features you want, including custom layouts, scrolling animations, and more. A custom-made design created with your specific user persona in mind helps to significantly increase the sales. Needless to say, you should pay more, but the chances of someone else having the same design are zero in this case. When it comes to custom design, it’s difficult to figure out possible costs. 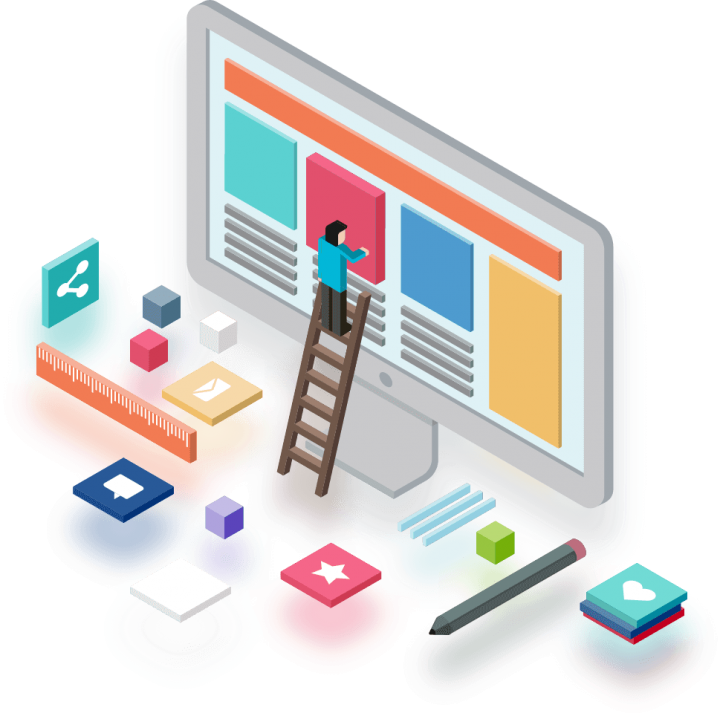 Generally, a custom layout design may approximately cost from $10,000 to $100,000 depending on the specifics, requirements, and complexity of the website. 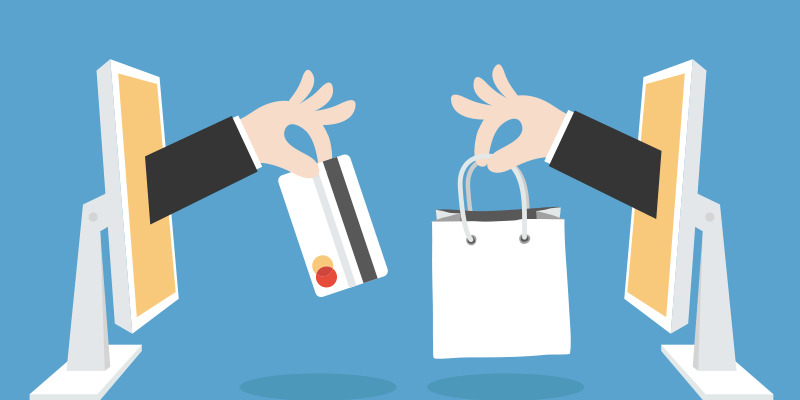 Typically, ecommerce functionality makes the greatest cost of an online store. A successful retail company should provide the latest, efficient, interactive functionalities to navigate the website easily and find the products that the customers are looking for. For instance, you might need customized search functionality due to the type of product you sell or you want to offer an effective checkout with special benefits for clients. These kinds of functionalities demand extensive programming and thus only bigger budgets can sustain the design and development of these features. Numerous ecommerce platforms offer various modules or extensions where functionality has been developed by someone else and can be applied to your online store for a much lower price than you could build on your own. However, you need to check what plugins are available before writing custom code. Quite often extensions are incompatible with certain online stores. Our company always evaluates extensions for effectiveness, security, features, and integration before advising them to our clients. Hosting services – the most typical type where you “rent” space from the servers of web hosting providers such as Amazon. Hosted platforms – you can build your online store on platforms with built-in hosting such as WordPress or Shopify. Host your own – a self-hosted website where you manage everything yourself. Web hosting cost is one of the easiest aspects to calculate when we talk about ecommerce website development cost. The majority of SaaS platforms include some level of hosting, though they can have some restrictions in the amount of storage, traffic, orders, customers, and products. The costs start cheap and grow as your sales volumes increase. Expect to pay at least $20 – $250 per month. Hosting for a custom ecommerce online store is likely to start at around $250 – $350 monthly for decent service and support. If you also need to include high-quality security, high speed, scalability the cost for hosting can go up to $2,000 monthly. Amazon Web Services offers low-cost ways to host ecommerce websites. It supports a broad variety of website hosting options. The price for optimal package storage starts from $320 to $1,000 per month. However, you need DevOps to create cloud instances to obtain optimal performance. You should pay an additional price for the implementation. Developer rates. Image credit: engineerbabu. Ecommerce developer rates depend considerably on the expertise and location of the web developers. According to Upwork, ecommerce developers charge between $5 and $125 per hour. North American developers charge the highest, followed by Western European, Eastern European, South American Asian developers respectively. Expert agencies specializing in designing ecommerce online stores charge between $50 up to $250 per hour. Working with an agency is a more reliable option than working with a freelancer. A small-sized ecommerce website is determined by a few aspects: small product catalog (100-1000), some custom programming (mainly concerning the appearance of the site and the structure of pages), off-the-shelf themes, light traffic, basic design. Small websites have no more than 25 pages and out-of-the-box functionality. Estimated small ecommerce website development cost: $2,000 to $15,000. A medium-sized ecommerce website is built using an average product catalog, medium traffic (1000-5000), customized themes, unique functionality, design and development of “pro” features. Medium-sized ecommerce stores usually have less than 100 pages and a content management system. Estimated medium ecommerce website development cost: starting with $15,000 – $30,000. A custom ecommerce website is built from scratch and usually has a large product catalog, high traffic, custom layouts and imagery. In addition, it has custom design, custom programming, system integration, great variety of payment methods, multiple shipping options, a content management system, unique functionality, order tracking, refund processing and other advanced features. Such custom stores usually have more than 100 pages and a content management system. Estimated custom ecommerce website development cost starts from $30,000. Bear in mind, that all these estimates cover only the initial costs to establish an online store, and do not include upcoming monthly costs to maintain a site or extra costs such as marketing and branding. Ecommerce platforms can be an excellent solution for launching an online store, as they are constantly evolving. They provide you with all the important out-of-the-box features, inbuilt functionalities and a drag-and-drop interface that makes the store management process as easy as possible. There’re many ecommerce platforms available on the market such as Salesforce, Magento, Shopify, Hybris and lots more that support all the essential functionalities. As you can see, you have a great variety of options, so you just need to decide which one suits your retail business best. Our company specializes in the development of online stores with the Magento platform. It is considered to be one of the most frequently used platforms for ecommerce. It offers simple layered navigation, wish lists, advanced search, categorized products, multi-currency payment systems, a content management system for static pages and more. Magento is a solution that suits all types of businesses from small businesses to large enterprises. Magento website cost. Image credit: konstantinfo. 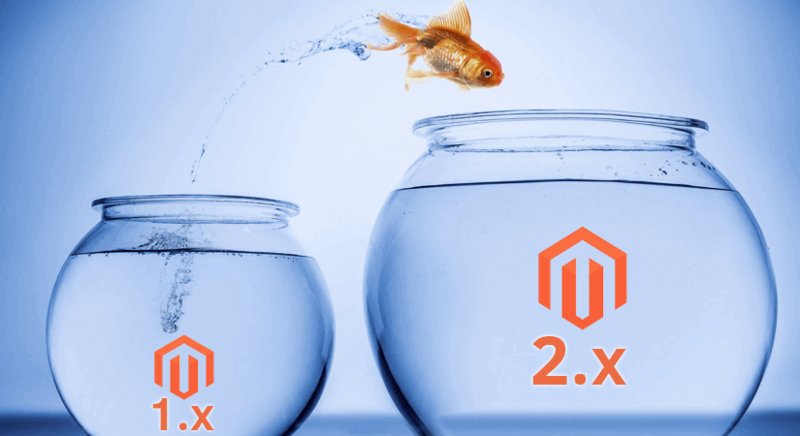 Estimating the costs of developing a Magento ecommerce website is not an easy thing as prices alter every year and vary country by country. If you need to upgrade your current online store, or you decide to launch a new one, we recommend you start by analyzing web design, custom functionality and web hosting to set the budget. Due to the versatile out-of-the-box features Magento development requires skillful and experienced specialists who ensure that the ecommerce website functions in an effective way and has a beautiful layout. 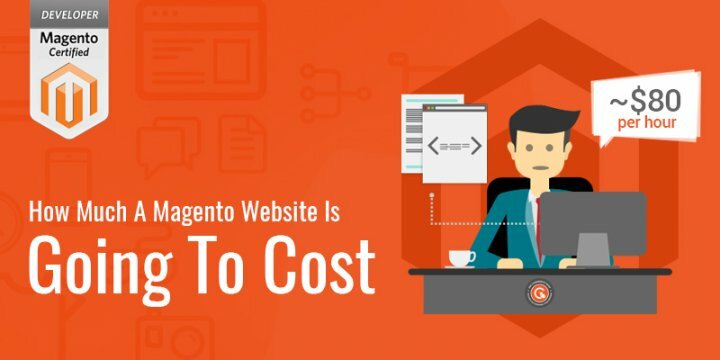 To assist you in estimating your ecommerce budget and avoiding any surprises along the way, here are some insights on the average cost of a Magento website. 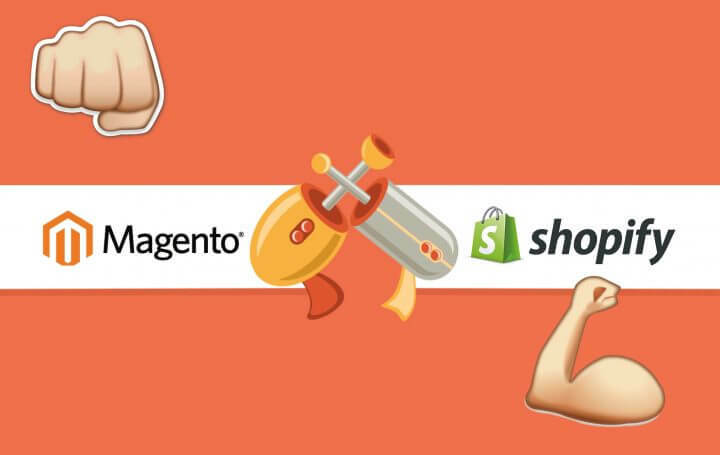 How much does it cost to design a Magento store? A factor influencing Magento website design cost is the type of theme applied. When you design your website you can apply readymade themes or custom design. Readymade themes can be bought separately, and there are thousands of options according to brand characteristics. However, they differ greatly in price. If you decide to choose themes from Magento 2 marketplace, the price is going to be at the range between $0 to about $450. Although applying a pre-built theme may not give you the possibility to design a website that is unique for your project, it’s quite a safe solution to build a complete online store with an attractive interface as quickly as possible. Instead of purchasing readymade themes, you can also design a custom theme. In this case, all the visual and functional features are created from scratch. Generally, the price for Magento customization ranges from $1000 to $2500 depending on the complexity of customization. Moreover, you need to hire a web design agency to sketch and design a new online store for you. Prices for these services are very different, possibly reaching more than $10,000 depending on your customization demands. When we were building Watches of Mayfair an online shop for a UK-based international luxury brands supplier, we used custom-made design. They decided to adopt a custom design to build a website that is unique and reflects their professional image. So our web designers considered the site’s target audience, function and traffic when working on the design. We developed all the visual and functional features of the website like color palette, font size, layouts of the web pages, scrolling animation, responsive adaptation, and many other design characteristics specifically for the brand’s certain business goals and targeted niche. Improved layered navigation, including site search boxes, is apparent across the entire site so that users can interact with the brand and the products in an effective way. How much does it cost to implement custom functionality for Magento-based ecommerce stores? There are Magento websites with simple, complex and highly complex functionality. Simple functionality. A website with simple functionality just needs to show the information about your retail company, provided products and services, which are displayed on the Home page, the Category/Products page, the Search and the Contact page. Complex functionality. A website with complex functionality usually incorporates dynamic content. It contains general informative pages that are displayed on the Home page, Categories/Products, Shopping cart, Product gallery. Highly Complex functionality. A website with highly complex functionality is a fully customized website supporting many advanced functions. For instance, it provides analytics and reporting enabling you to process consumer input. It goes well beyond the complexity of a basic CMS backed website. The more functionality a website can support, the more expensive it is. We usually design websites with complex and highly complex functionality. 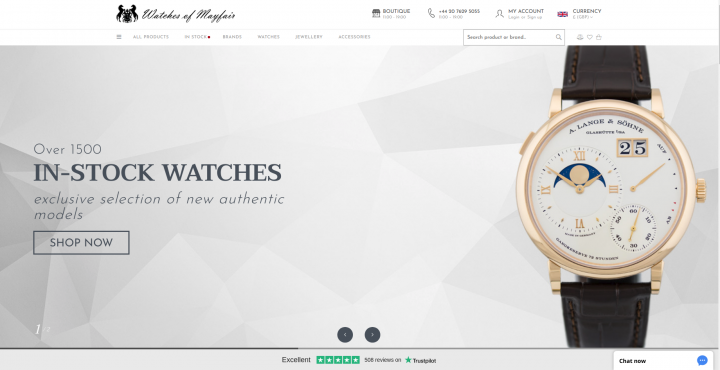 For example, for Watches of Mayfair we implemented a highly complex functionality with dynamic content. We organized the website content into logical categories like brands, watches, jewellery and accessories. We also added filters with a delete option for better user experience. 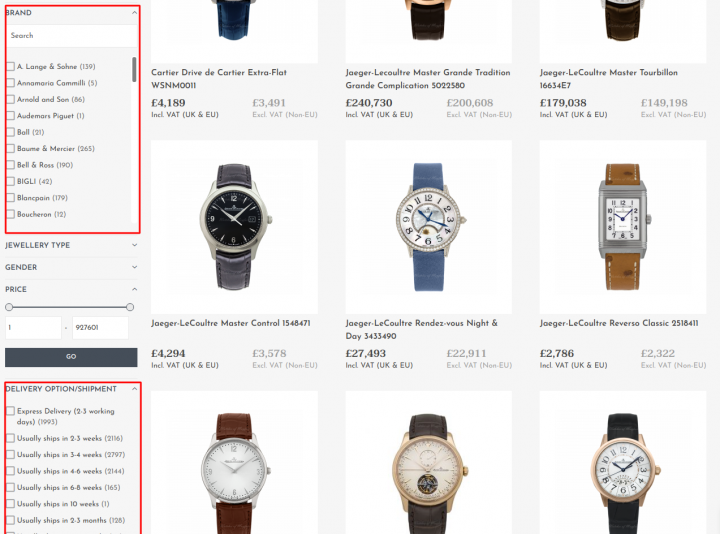 Featured category carousel allows to hover an image and add a product to a cart, to a comparison list or to a wishlist. What is more, we extended bank transfer payment (separate instructions by currencies), one step checkout (every customer can enter personal data, choose packing, check order review, add comment, agree with terms and conditions, create account for later use), and default wishlist (hover effect is applied to every product’s image) functionality. We implemented a custom form (enquire book, appointment etc. ), new shipping method (store pickup) and Trust Pilot (review platform) functionality. Trust Pilot enables the company to collect and easily manage customer reviews. How much does web hosting cost on Magento? Choosing the right Magento hosting provider is pivotal to your business long-term success. You can select hosting from the list of Magento Technology Partners, where you can filter your search by location. The monthly fees differ significantly from one web hosting provider to another, depending on the services included and how much traffic a website handles. As a rule, our customers pay approximately between $20 and $150 for shared Magento hosting and from $500 to $800 for dedicated servers. Shared hosting has lower costs, but it also has its restrictions. It’s not the best option for online stores with large traffic. If you wish to expand your business and think about long-term perspectives it’s better to choose dedicated servers. For our project Watches of Mayfair we used Amazon Web Services. Our DevOps implemented the software to obtain optimal performance. How much do Magento developers charge per hour? Developer rates. Image credit: thecommerceshop. The hourly rates for Magento development depend on the level of experience and region of the developer. We’ve examined developers by region and by type of certification. In comparison to a certified developer, a solutions specialist can charge $20-40 more hourly, regardless of the region. A Solution Specialist knows all the features and architecture of the Magento platform, as well as the basic information about ecommerce. He/she can efficiently use this knowledge on practice. Majority of Solution Specialists work in the Admin Panel, handling daily operations like merchandising and promotions. Some are engaged in architecting the project before designing the website. Some are Certified Developers that assist in implementing the requirements. That’s why they charge more money. Solution Specialists works directly for a customer, through an agency or as freelancer. Services provided by qualified Magento developers will cost between $50 to $250 per hour. The more skilled the developers, the higher their rates per hour. There is a possibility to choose between a freelance web developer, or take advantage of the services rendered by an agency. Regional differences are obvious. North American developers charge the highest, followed by Western European, Eastern European, South American Asian developers respectively. The cheapest developers (South-East Asia, India, Pakistan) charge $10-20 per hour. The typical rates per hour vary from $20 to $60 in Eastern Europe ( Ukraine, Belarus) while in Western Europe (Germany, Netherlands, France) the United Kingdom and the United States of America it’s about $150-200. Our company offers skilled developers at an affordable cost. How much to build an ecommerce website? As pointed out, there is a number of different aspects that influence the ecommerce website quote. Each business is different and has its own requirements regarding the website and its online presence. It’s important to gather all the requirements during the discovery phase and outline the business objectives of your ecommerce project. If you require further information or have any questions, please don’t hesitate to contact us at hey@elogic.co. We can help you with estimating the cost to build an ecommerce website tailored towards your specific business requirements. We provide our clients with a variety of solutions to fit different budgets. We hope you have found this article about the cost of developing an ecommerce website useful.